The Ultrasonic Power Probes are capable of acoustically activating many different processes. The Power Probe may be attached to a Booster or a combination Booster/Waveguide with a replaceable Wear Tip to create a functional system. The Booster offers the ability to amplify the peak-to-peak displacement of the Power Probe. The Waveguide offers the ability to move the Wear Tip away from the Power Probe due to the physical geometry and space limitations required by the installation. The Wear Tip is a removable and replaceable section of the acoustic transmission link. The Wear Tip can be replaced after cavitation erosion has minimized the Tip's effectiveness. The Permendur Power Probe is our most powerful probe available. The Power Probe is activated by a transducer fabricated from the Permendur magnetostrictive alloy. The Permendur alloy offers the ability to convert high power electrical energy into mechanical motion. The transducer is activated with a fluctuating magnetic field. As the strength of the magnetic field increases, the length of the Permendur alloy also increases. The Permendur Power Probe System consists of two major components. 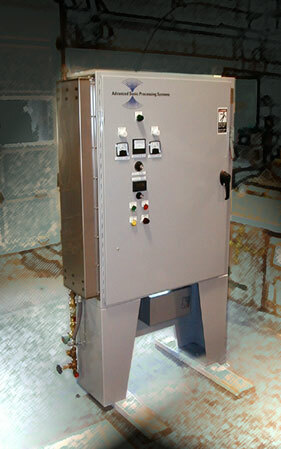 The magnetostrictive Power Probe complete with cooling housing, and the ultrasonic generators mounted in a NEMA-12 electrical enclosure, as seen below. with the optional water cooled cabinet cooler.